Homolovi State Park was established in response to public concern about the devastation of the Homolovi sites by illegal collectors of prehistoric artifacts. The damage to the sites peaked in the 1960s when a backhoe was being used at Homolovi II to dig through burials and kivas. The residents of Winslow and leaders of the Hopi people, supported by other people throughout the State, began to work to protect these sites. It was their dream that the entire area would become a State Park. The primary Homolovi interpretive resources consist of archaeological sites including four major pueblos, numerous smaller structures, and site features ranging in size from one-room pit houses or simple artifact scatters to a 1200 room pueblo, and panels of petroglyphs with depictions of kachina and clan symbols. The sites date from three main periods: AD 620-850, AD 1050-1225, and AD 1260-1400. During each of these periods there was a concentrated population of people living near the Little Colorado River. Members of the Hopi Nation consider this area an important ancestral site and return to Homolovi for religious purposes. In September 1980, Governor Bruce Babbitt along with State Land Commissioner Robert (Bob) Lane, and a local rancher and grazing lessee, Floyd Hahn visited Homolovi II. After viewing the extent of damage to the site and a number of artifacts on the ground located on State land, the Governor invited several archaeologists and citizens to a meeting to discuss potential actions that could be taken to preserve these cultural resources. 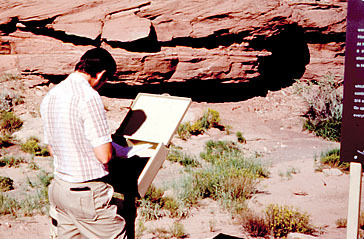 As a result of these discussions, in November 1980 the Governor established the Archaeology Advisory Group to work with the State Land Department. 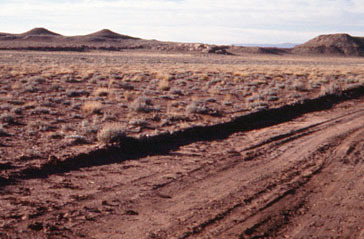 At the direction of Governor Babbitt, the State Land Department developed a plan for the protection of the State-owned archaeological sites with an emphasis on the protection of the sites in the Winslow area, including Brigham City, Chevelon Ruin, Cottonwood Wash Ruin and Chavez Pass Ruin, in addition to Homolovi I, Homolovi II, Homolovi III and Homolovi IV. The 1981 feasibility study recommended that the best means of protecting the sites was the creation of a regional archaeological Park to include all of these sites. By 1983, an advisory group called Homolovi Management Board (HMB), chaired by State Land Commissioner Robert Lane, concluded the preferred development plan would only include the four Homolovi sites, Cottonwood Wash Ruin, and Chevelon Ruin. The HMB had representatives from the City of Winslow, private property owners, New Mexico and Arizona Land Company, U.S. Forest Service, Arizona Game and Fish, and the Bureau of Land Management. The HMB created the Homolovi Planning Committee to provide ongoing direction and advice to the planning consultants. The Committee included representatives from adjacent landowners, the Hopi Tribe, the Arizona State Museum, Arizona State Parks, and the Governor’s Office of Economic Planning and Development. Because of the importance of these sites in the history of the native people of Arizona, the Arizona State Museum began a ten-year research program in 1984 to determine the extent of archaeological resources within the Park and to study the development of the large pueblo structures. Planning for a park began in earnest in 1985 when the Homolovi Management Board, through the State Land Department, hired Gerald Doyle and Associates to produce a plan for the establishment of the Homolovi Park. The completed plan included recommendations concerning the construction of a visitor center, trails, exhibits, limited camping areas and road improvements. The Master Plan for the Proposed Homolovi State Prehistoric Park identified approximately 10,000 acres for potential inclusion within the Park boundary (See Appendix 4, Phase II). This Park was expected to have a substantial impact on the depressed northeastern Arizona economic environment by drawing travelers off Interstate 40 to spend time and money in the area. The State Land Department, Arizona State Parks, U.S. Bureau of Land Management, and the Homolovi Management Board endorsed this Master Plan. The Legislature established the State Park in 1986 when it passed House Bill 2498 (Chapter 396) giving the State Parks Board the authority to acquire, develop and operate the Homolovi archaeological sites as a Park and appropriated $890,000 for that purpose. Governor Bruce Babbitt signed the bill on May 21, 1986, during a ceremony held at Homolovi II. The Park was recognized for the importance of the prehistoric and historic sites located within its boundaries and for the need to protect this area from further vandalism and illegal collection of artifacts. The Parks Board reviewed and approved the site plan for Homolovi State Park on July 11, 1986. The Board also authorized the Executive Director to pursue acquisition and/or leases as necessary for the protection and operation of the Park. Funding was available in 1986, but acquisition of the majority of the land for the Park took much longer than anticipated. In November 1986 negotiations began toward the purchase of the New Mexico and Arizona Land Company’s property and an application was filed with the Bureau of Land Management for the 80-acre parcel that included Homolovi I. The initial properties were acquired from the New Mexico and Arizona Land Company on December 5, 1986, and a second acquisition was made on May 17, 1989. The Bureau of Land Management application was processed and a Patent was issued to State Parks on March 26, 1987. Although a Commercial Lease Application had been filed earlier with the State Land Department, in May 1988, it was determined that the quickest way to obtain a lease of the more than 3000 acres of State land within the Park boundary was for the Parks Board to file an Institutional Taking. On May 12, 1988, State Parks filed the Application for Institutional Taking of State Land with the Governor (not the State Land Department). The Governor approved and signed the Application on June 9, 1988, and State Parks took immediate possession of the State land. On July 21, 1988, a Complaint was filed against the State Land Commissioner concerning the Institutional Taking of the State land for park purposes. Mitchel Platt, attorney for John A. Thompson, one of the existing State lessees on land taken for park purposes, filed the Complaint. In September 1988, State Parks filed the Application for an Institutional Lease on 2,960 acres. This Application was amended in October to include another 160 acres because the exchange had been finalized for the private acreage in section 30. In March 1989, each grazing lessee within the Institutional Taking area was notified of the action and State Parks requested an inventory of their improvements that had been made on the State land. An appraisal of all the improvements was completed so individuals could be compensated as required by the Institutional Taking. The Institutional Lease No. 89-96378 was issued to State Parks on May 26, 1989, with an ending date of May 25, 1999. On July 19, 1989, State Parks received a Summons from Navajo County Superior Court on behalf of John A. Thompson. After Mr. Thompson released his legal counsel in the fall of 1989, Merv Mason, State Land Department, and Charles Eatherly, State Parks, met with him several times in Winslow to work out an acceptable agreement to resolve his concerns. The agreement was reached and the official Settlement Agreement was signed on November 30, 1989. On December 29, 1989, the Superior Court of Navajo County gave an Order to dismiss the Thompson’s lawsuit. All other necessary legal documents were signed and Mr. Thompson was paid the appraised value of his leasehold interest and improvements ($36,400) on March 30, 1989, by State Parks. At that same time the other two State land lessees, Mr. O’Haco and Mr. Hahn were paid for their leasehold interest and improvements $11,000 and $25,000 respectively. 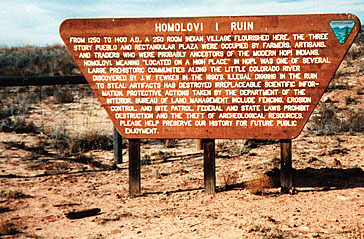 The Board officially named the property Homolovi Ruins State Park. Jones Studio of Phoenix was hired in 1987 to design and oversee the initial construction of Park facilities and the Department of Transportation hired a consultant to design the entrance and interior roads and parking areas. While the Park was under construction, the offices were located in the old Hubbell Trading Post in Winslow. Karen Berggren was selected as Park Manager. After a long and difficult time in acquiring the land (See Appendix 4) and completing the improvements, the Park was dedicated and officially opened to the public on May 22, 1993. Billie Axline Gentry, Chairman of the State Parks Board, welcomed everyone. Mayor Georgia Metzger spoke about the 13 years that the Park had taken to evolve. A letter from Representative Karan English (D-Ariz.) was read. Hopi Tribal Chairman, Vernon Masayesva, spoke of the partnership represented by the Park. James Babbitt of Flagstaff represented his brother Bruce Babbitt, U.S. Secretary of Interior, and spoke of his family’s interest in the Park. He referred to the work of Bruce Babbitt, Lou Ceballos and the Hopi officials in making Homolovi Ruins State Park a reality. Dalton Taylor of the Sun Clan performed a Feather Blessing of the center. State Park Director, Ken Travous, thanked all the individuals who had helped make this Park a reality. From 1986 to its 2011 reopening, the name of the park was Homolovi Ruins State Park. The Hopi tribe lobbied the Arizona State Parks Board to remove "Ruins" from the name, as the Hopi tribe considers them spiritually alive. During a meeting in Winslow on March 17, 2011, the board unanimously voted to change the name and to add the tagline "ancestral Hopi villages" to the park. The historic cemetery of Sunset is of great significance to the local community and its past. Established in 1876, this Mormon settlement boasted the first post office on the Little Colorado River and was near an important ford of the river. The town was abandoned in the 1880’s. The only obvious remains of this town are the headstones in the small cemetery.